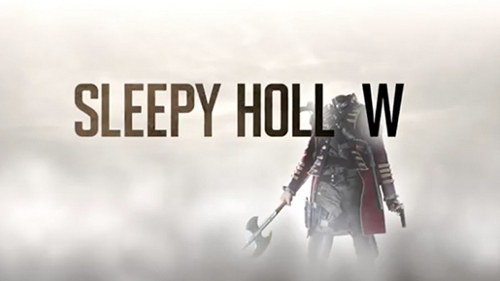 Tonight I check back in with the most ridiculously premised new show this fall: Sleepy Hollow! We open with Ichabod Crane running from 4 dudes on red-eyed horseback, one of whom is headless. The idea that this guy can outrun horses is the most realistic part of this show. Now tree branches are grabbing him and pulling him under ground! Tough day, IC. Oh look it’s his dead wife! Here to deliver another dire message about the apocalypse. Ya know Katrina, a nice “I love you and miss you” would probably be comforting. But noo you’re all one-track mind, giving him vague warnings as you disappear into the mist. Moving on…ah it was a dream! But probably one he should pay attention to. Now it’s time for exposition! In case you missed the pilot, the cops are recalling how IC claims to be from 1781 (I think, I’m too lazy to look up the exact year he’s claiming), knew George Washington, passed a polygraph about it, etc. While they’re discussing this, have some visuals of IC learning about 21st century technology for your amusement. Lamps! Showers! Hair dryers! Coffee makers! Television! OMG it’s an ape on a horse! Fun times. So Abigail’s boss thinks IC is crazy, yet may be his only hope of figuring out what’s going on so he’s going to let them continue to investigate…because that’s how cops work. They say hey detective, take your crazy pants witness and go solve some crimes! As if that wasn’t dramatic enough, here’s a body resurrecting in the morgue! OMG it’s John “Pez Head” Cho! And his neck is still fully ready to dispense candy. Ew he just yanked his head back right side up while he talks to the monster that killed him in some weird language. Now he’s pulling some kind of necklace out of his mouth. Um monster guy, I don’t want to question your judgment or anything, but giving the guy a necklace when his neck is ridiculously wrinkled and icky looking from his Pez head sitch is just cruel. You’re just going to draw more attention to it! A considerate monster would have given him a turtleneck instead. That neck is UNSIGHTLY. Apparently the demon monster thing wants him to use the necklace to release somebody. This is what Pez Head/neck looks like. It’s pretty gross. And now for the opening credits! Okay I’m going to have to just stick with major highlights from here on out. There is just too much ridiculous going on in this show for me to keep this up! It’s “how I met my wife”, the Sleepy Hollow version! Coupled with complaints about levies on baked goods. IC is anti-tax because of you know the Revolutionary War. If this was a drinking game I’d be wasted by now. OMG that’s totally what I’m doing wrong. Should have been drinking this whole time. From now on take a drink every time he mentions any aspect of America’s fight for freedom. Or don’t. I don’t want to send you to the hospital with alcohol poisoning. Former Pez Head is driving around with that icky neck of his. And his skin tone is just not great. Death does not agree with him. Dude zip up your jacket or something, your neck is making me ill. This picture, on the other hand, is cracking me up. I love the internet. IC is at the graveyard trying to understand Katrina’s message. “She was referring to a witch!” Congratulations Einstein. That was pretty obvious from the get-go. Glad you figured out that riddle. Former Pez Head puts the necklace on a pedestal and has raised someone who looks even more icky than he does. She has to take people’s flesh to reclaim hers. Is it wrong that I’m rooting for her to succeed so she doesn’t look so hideous? Now FPH is pulling over some guy. And the guy is like “Are you okay? What happened to your neck?” OMG guy, you can’t just ask someone what happened to their neck. FPH is all “It’s hard to explain.” Well that’s the effing truth. So the guy is going to die soon. FPH says it’s not personal. I don’t think that makes this guy feel any better. Are you sure it’s not personal for that whole crack about your neck John Cho? Here’s creepy looking witch chick. She set the car on fire. Back to IC and Abigail. George Washington name drop! Drink! IC calls out Abigail for being overly sad about her partner/Sheriff who died last week. Apparently he saved her from a life of crime, that same old song. In case that was too much character development for you, now they’re back out in the field to check out the fried dude in the car. IC is about to say something crazy…and it involves the war! Drink! There were a bunch of mysteriously murdered men at the time, totally by that icky looking witch that came back apparently. That’s the gist. She’s evil. Now back at the station (man these people move around a lot) IC runs into some dude named Luke and tries to pretend that he’s just a professor from Oxford. Then Abigail comes and gets him and there’s some weird tension and Ichabod is all “Ooh girl I know something happened between you two!” (more or less) and she’s like “Psshhh ancient history, moving on.” IC hilariously tries to talk to Abigail about why they broke up and if they are going to get back together. Apparently IC likes the gossip. Now it’s time for some impromptu renovation on the police station! Let’s knock a hole through the wall! Ooooh secret tunnel, intriguing. And the secret tunnel lets them get access to dead Sheriff’s files which will hold all the witchy answers they need. John Cho and his gross neck are back to apparently let us know a kid will die next. Super sad. Back to the files – now they have discovered the origin story of the icky witchy woman. Moral of the story: witches may burn but they never fully die. She is going after the descendants of the guy that burned her. Now they shall try to stop her! Fortunately the kid we thought was going to be next actually gets to live! Oh because he’s adopted. Fun story kid, adoption saved your life! The witch took the dead dad’s ashes from the mantle instead. Woohoo for lack of child murder on this show. Back at the station IC goes to get Abigail some coffee and she falls asleep to dream about poor dead Sheriff Corbin. He talks to her about fear ruling her life and keeping her from being able to see what she’s meant to do. And she’s like and what is that? And he’s like you’re the only person that can tell you that. Oh what a cop out! (ooh see what I did there? COP out? Lame but I love it.) Then he says, “Don’t be afraid of number 49. That’s where you’ll find you’re not alone.” Whaaaat? Talk about vague! He and Katrina can start a club. Then IC comes up behind Abigail and whaaat she’s not asleep? She’s actually standing in Corbin’s office! So was he a ghostly apparition? Or was she just like sleepwalking/hallucinating? Oooh an answer – Room 49 appears to be where Abigail’s sister lives in the mental hospital. She takes pills but doesn’t take them – they’re obviously under her tongue. Dumb nurse, everybody knows that you check under the tongue! What a rookie mistake. The scary monster appears behind Abigail’s sister for a second then disappears. Watch out girl, or you could be made into a Pez dispenser as well! Ahhhh! Well that’s the end of that episode, finally. Longest recap ever. I don’t know if I like this show better or worse after that. I kind of admire how crazy it is. It’s at least entertaining. It makes me laugh. And it gave me over 1900 words worth of material so I guess that’s a plus. I’ve been trying to figure out who Abigail reminds me of and I finally have it: Miranda Bailey on Grey’s Anatomy! She has the same sort of serious don’t-mess-with-me thing going on. Does anybody else see it or is it just me? 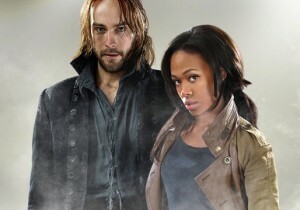 Is anybody else watching Sleepy Hollow? What do you guys think of the show? Fun or too ridiculous?